The putative author of the Dao De Jing (or Daodejing , Tao Teh Ching , or Tao Te King , etc.). Trouble is, he only may have written it and, for that matter, there only may have ever been such a person. Literally the "name" means "The Old Boy," so it's not really a name at all - just an epithet. It derives from the legend that he was, from his birth (following a miraculous conception by a falling star and his mother's extended pregnancy), an old man. Lao Zi was, of course, Chinese, and amusing stories abound of his encounters with Confucius although no one has any idea if they could have been contemporaries. It has become fashionable in modern scholastic circles to say that someone simply compiled bits and pieces of ancient folk wisdom into the eighty-one short verses which make up the Dao De Jing and this may, indeed, be what happened. All the same, I prefer the prevailing legend that Lao Zi was the Emperor's archivist [record keeper — a prestigious and important position roughly equivalent to the Attorney General in today's United States Presidential cabinets] until, disgusted with the way the world seemed to him to be going, he set out to leave the country. At the western wall he was detained by a guard who recognized him and refused to let him pass until he wrote down his wisdom. He did it in one sitting, left and was never heard from again. For what it's worth, I love Lao Zi, I love his Dao De Jing, and I am deeply grateful to that insistent guard. A note on romanization of Chinese words. Before you go any further I want to make sure that you understand that I neither speak nor read a word of Chinese and that I am now about to expound upon the meaning of an ancient Chinese text. Got it? "Jing " (or "Ching ") is the word the Chinese apply to sacred texts. It's often translated as "classic." 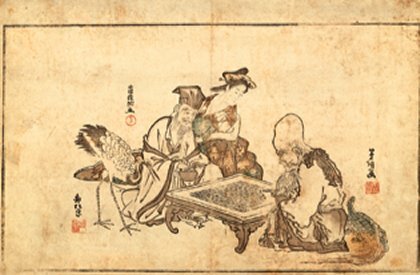 In the US, surely the most famous "jing " (at least since the dawning of the Age of Aquarius and its channeling hordes) is the Yi Jing (or I Ching ), usually translated as The Book of Changes . "Dao " (or "tao ") and "de " (or "teh ") are two of the central concepts described in the text, and the title, Dao De Jing is said to derive from the fact that the book has, by tradition, come to be divided into two major parts, one of which begins with the word "dao," the other with a discussion of "de." Ah! Okay. I'll get there. But first... (a tiny bit of patience may pay off and, anyway, you're holding the mouse). The Dao part traditionally has thirty-seven chapters, the De part contains the other forty-four verses. And, aside from their extreme brevity, they have (and on this I must trust those who do actually know something of Chinese) frequently, the tone of nursery rhymes. They're playful, and childlike, and immensely powerful. Probably very easy to memorize. Well, I'm ready, at last, to tell you. And what I can tell you is that you're going to have to decide for yourself. It appears, much of the time, to be a recital of suggestions for the Emperor (now, in our era of compulsive political correctness, often translated as "leader") to follow in order to rule ("lead") effectively. But they are invariably counter-intuitive and take on the quality of Alice's encounters as she wandered through her looking-glass. Wisdom is the understanding that knowledge is useless. The only things that valuables are valuable for are attracting thieves, causing the fear of thieves and creating the expense of protecting against the inevitable theft. All that is best can be seen to be like water. Water benefits everything and yet exerts no effort. Water finds the lowest places, shunned by all. To end strife ignore the talented. Best is the emperor who is barely known. Next the ruler who is loved and honored. Then the despot who is feared. And finally the tyrant reviled. Horses pull ploughs and their dung fertilizes crops. The reward for bravery in battle is death. Hey, I could go on like this forever. (Or at least for eighty-one chapters.) And I haven't even mentioned de yet. And maybe it's best that I don't. Go read about it for yourself. So, of all of the scores of English translations (and non-translated "versions") of the Dao De Jing now available, which do I feel most truly convey Laozi's intended message? I have found a few that I can wholeheartedly recommend, but with a caveat: I believe that it's essential to keep two and preferable all three of these (plus any others which speak to you) at your side and to refer to each of them regularly. They will shed light on each other while each, alone, can be misleading. A New Translation Sam Hammill Shambhala Publications, 2005 ISBN: 1-59030-011-4 This is a lovely translation and may be becoming my favorite. ISBN: 0-520-24221-1 This is a diamond! I would definitely recommend that anyone who loves Laozi own this book. Roberts' verses are powerful and right on. But this is not the place to begin. The language is compact and often hard to follow. All in all I'm as glad that I found it last as I am that I found it. A Book about the Way and the Power of the Way Ursula K. Le Guin Shambhala Publications, 1997 ISBN: 1-57062-395-3 Le Guin explains in her introduction that she speaks no Chinese but that her father loved the Laozi and that she was fascinated by the character-by-character literal translation he owned. She writes beautiful, clear English and I keep her little volume close at hand. A brief glossary of key terms used in the Dao De Jing . Jeff Rasmussen's Images of Taoism from Lao Tzu's Tao Te Ching . Einzelne Kapitel aus verschiedenen Quellen. zhongwen.com (full Laozi text in Chinese and in English with a convenient method for finding the etymology of the Chinese characters as you go through it). How to join the Ring. Please send any comments, suggestions or criticisms to Maury Merkin. Yours is visit #192046 since March 10, 2001 (when this file was renamed).